* Lease a 2019 Honda Civic Coupe LX CVT for $189 per month for 39 months. $995 down payment. Offer expires 4/30/2019. Sporty, yet functional, the 2019 Honda Civic Coupe is the perfect vehicle for individuals on the go. This two-door vehicle has modern technology features, a relaxing interior, and a fun-to-drive engine. Find the 2019 Honda Civic Coupe in four trim levels; LX, Sport, EX, and Touring. 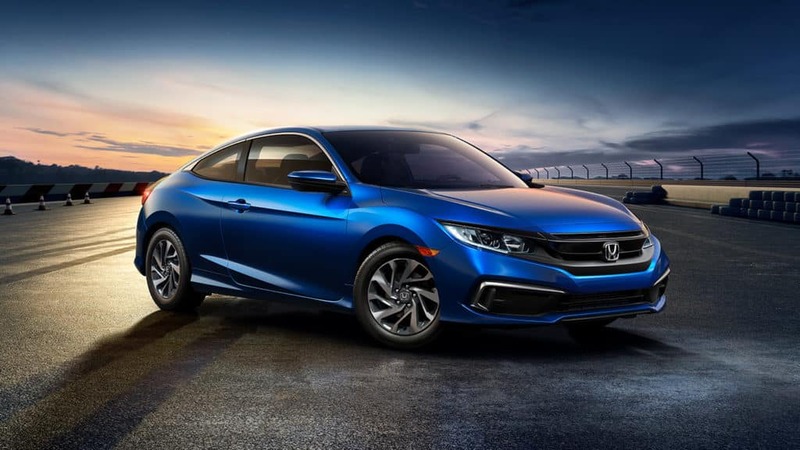 The base trim level of the 2019 Honda Civic Coupe, the LX, is powered by a 2.0 liter four cylinder engine, which is paired with a responsive and smooth continuously variable transmission. This engine and transmission pairing achieves 158 horsepower, perfect for the athletic driver who’s interested in sporty strength. However, if you’re seeking more power in your Civic Coupe, upgrade to the Civic Si, which features a 205 horsepower engine and a six speed manual transmission. With great strength comes great safety. Honda is dedicated to protecting their drivers, which is why the Civic Coupe comes standard with Honda Sensing. Honda Sensing is a suite of safety technologies, which helps drivers stay alert and focused behind the wheel. Included in the Civic Coupe safety suite is collision mitigation braking system, road departure mitigation system, adaptive cruise control with low speed follow, and lane keeping assist system. Climb into the interior of the 2019 Honda Civic Coupe and find sporty, sleek styling. The cabin of the Civic Coupe includes a leather-wrapped steering wheel, a leather wrapped shift knob, available heated front seats, an ergonomic instrument panel, push button parking brake, a sliding armrest with cupholders between the front seats, and racing inspired pedals. Powerful, fun, and perfect for those living in the city, the 2019 Honda Civic Coupe is a must-see. Come check out this vehicle for yourself by heading to Millennium Honda. Our dealership is located at 286 N Franklin Street in Hempstead, New York, or you can contact us by phone at 877-557-8230 today! * Lease a 2019 Honda Civic Coupe LX CVT for $189 per month for 39 months. $995 due at signing. Offer expires 4/30/2019.